Prarie: Typical Altman... many diverse actors gather and interact naturalistically throughout semi-plotless film. This time, the actors are particularly diverse, with, for example, Meryl Streep, Lily Tomlin, and Lindsay Lohan all playing a family (albeit not totally convincingly). I, for one, didn't think everyone quite geled, but they were all fun to watch anyway, and the great music got me through the lack of plot. Not one of Altman's best efforts, I don't think, but then, not all of his his films can be. Thoroughly charming and quirky, if a bit haphazard and meandering. Disclamor: I had a random stomach ache creep up on me while I watched this, and that may have colored my view of it; it was hard to enjoy much at the time, but if I saw it again, I might like it more. UPDATE: I did see it again, and I did like it more. Verdict: "A wistful charmer. Ages well." Prada: Super enjoyable. Pland disney-esque premise elevated tremendously by stellar acting and directing. Song choices are perfect. Editing is quick and slick. Clothes and bodies are divine. Adrian Grenier is delicious. Emily Blunt is bitchtastic. Stanley Tucci is fabulous. Anne Hathaway is lovable. And Meryl Streep is to die for. She'd better win the globe for this one (she's deserved that comedy/musical globe already for Postcards from the Edge 16 years ago). Not much else to say really... just go see this one, and then see it again. A stylish and resonant romp. Verdict: "A keeper. Popcorn fluff, but endlessly rewatchable." I loved her in both films. She does have the better role in Prada (and what a role! ), but does fantastic work in both films. I enjoyed "Prairie" more personally; my roots are from that whole bygone era of the midwest, so I had a sense of nostagia throughout the whole thing. It just had so many moments of hilarity and touching quietness (and incorporated the concept of death via undertones and one wonderful character), I haven't stopped raving about it since I've seen it. Mere trifle? I think not. 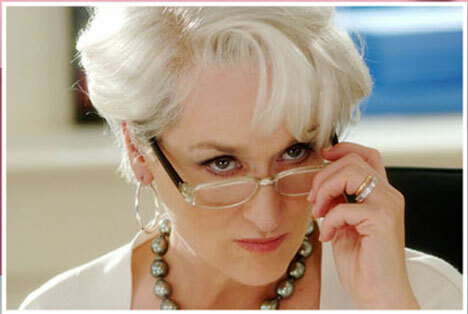 Devil Wears Prada was immensely enjoyable. I still don't get the fascination with Grenier (then again, I've yet to watch an episode of "Entourage") but here he's rather uncharasmatic. Tracie Thoms does the best she can with a thankless role (her scene when she receives gifts from Hathaway had me rolling) and Stanley Tucci was wonderful as always. Hathaway is effortlessly charming, and Blunt is pure comedic genius. Between her and Streep, the film got more laughs out of me than it had any right to. I wanted to love Prairie more than I found myself able to. Not that it wasn't good - very good even - but I just felt that the elements of it didn't quite mesh and it ended up feeling rather slight compared to, say, Gosford Park. I am harsher on it because it's Altman, as opposed to that guy who directed Prada whose name I can't even remember. Basically my reaction of slight disappointment in Prairie and total enjoyment of Prada, which exceeded my expectations, is what's keeping the latter foremost in my mind. I really do think it had the tighter and more cohesive ensemble cast (shocking), with everyone just spot on. I'm sad that Blunt isn't getting more attention. I will concede, though, that I had a bad stomach-ache during Prairie which I'm sure diminished my enjoyment of it considerably. I can't comment cause neither of these films are out here yet.